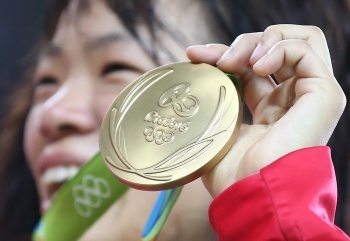 All of the Tokyo 2020 Olympic and Paralympic medals will be made from materials salvaged from recycled gadgets. The Olympic medals are made out of real Gold, Silver and Bronze. They are small, but there are quite a lot of them handed out over the course of the event, so quite a bit of the respective rare earth metals usually needs to be mined in preparation for the event. Tokyo is doing something a bit different for the 2020 games - it's relying on the public's sense of environmental responsibility, by making its medals out of 100% recycled gadgets. You may not realize it, but your phone, laptop, tablet or other electronic device contains small amounts of rare earth metals. Every year hundreds of thousands of these devices get sent to landfill, meaning these precious metals are wasted. The Japanese government, in collaboration with telecom NTT, will be offering collection boxes across its 2,400 stores in Japan starting this April. The goal is to collect 8 tonnes of metal, which will be melted down to form the 5,000 medals needed for the event. "Tokyo 2020 Olympic and Paralympic medals will be made out of people's thoughts and appreciation for avoiding waste," Japan gymnast and three-time Olympic gold medalist Kohei Uchimura said. "I think there is an important message in this for future generations." It's a really cool idea to think that the medals will essentially come "from the people".